If your idea of a vacation is great food and the beach. Come out October 30th through November 7th and sample some great Outer Banks restaurants. 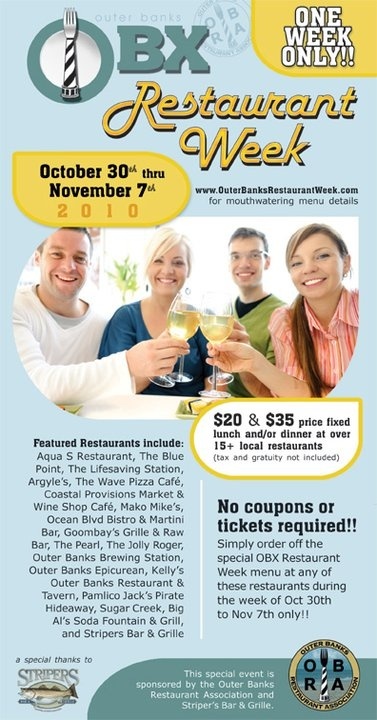 Here is some information from the Outer Banks restaurant week website, www.outerbanksrestaurantweek.com. Outer Banks Restaurant Week was created for you because we know you love The Outer Banks and you love to eat! No pretense or snobbery here — it’s all about our local chefs serving up delicious cuisine in some of the area’s best venues. Outer Banks Restaurant Week gives local food enthusiast and visitors an opportunity to enjoy 3-course, prix fixe lunch and/or dinner menus at several participating restaurants throughout the Outer Banks at a fixed price (tax and gratuity not included).